Again, I find myself not posting in quite sometime. This time its been over a year! I also haven’t been using this as a personal blog like I had planned. My intention was, and is, to share my thoughts as a Christian dad but I have really only been sharing devotional thoughts. Which are great and I’m not planning to stop with those types of articles, but I also want to share my everyday thoughts and concerns as a Christian dad and husband. One long standing thought of mine is family and self defense. I have been avoiding this topic a bit because for some reason it becomes a hot button issue. It can degrade into arguments very easily, but we’re not going to do that here. I appreciate comments and your thoughts on the issue, but I don’t appreciate rudeness or arguments for arguments sake. As I get older and my children get older, I find myself becoming more and more aware of my responsibility to defend them. I fall into a spiral of self doubt. Am I doing enough to keep them safe? What would I do if someone tried to hurt them? How would I respond if someone tried to take my child at the grocery store or at the mall? Could I even do anything? Do I have any skills or a plan to defend them? Or even myself? 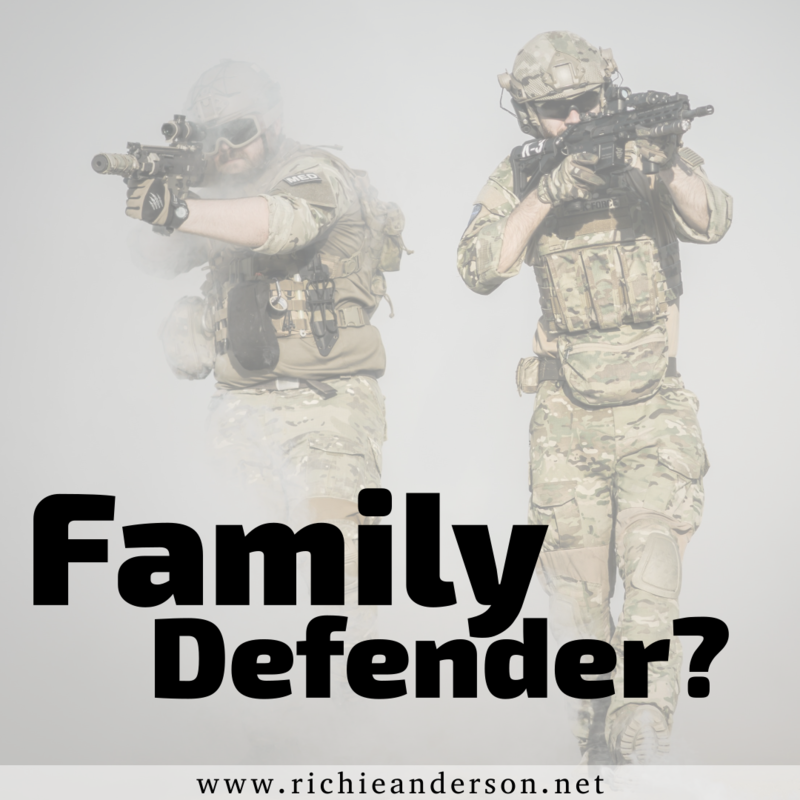 As a Christian, do I even have the ability or authority, to physically defend myself or my children? Am I still a child of God if I have to hurt or kill another person to defend my wife’s, children’s, or my own life? We will often go to the book of Luke to justify our ability and need for protection. Jesus told his apostles to sell their cloaks and buy a sword if they didn’t already have one (Luke 22:36), so we assume that we also have the right to protect ourselves. I think we need to be careful to apply this to ourselves, Jesus reminded them in verse 35 that before they didn’t need to take anything like gear, money, or weapons on their missions to spread news about Jesus because he, the Son of God, provided those things for them. But, after he is crucified they would be going out into the world, past the borders of Israel, without his protection. He is telling them as you go out this time you are going to need to provide these things for yourself. I’m not saying that this precludes you and I today of needing protection, but in this case he is speaking specifically to a certain group of people in their current situation. But take a look at Nehemiah, basically a governor, and his work in rebuilding the wall around Jerusalem. Some people didn’t want to see the wall rebuilt, these people liked having an unguarded city and easy prey. Evil people. These people planned to sneak in and kill indiscriminately so the wall couldn’t be completed. The friendly Jews who lived in surrounding areas warned Nehemiah, so he made sure there were armed men hiding in wait, willing and ready to do violence, to protect those who were working. Then he charged the rest of the inhabitants of Jerusalem to fight! Why? To protect their friends, their families and themselves. Paul wrote to Timothy that a person doesn’t provide for his family he is worse than an unbeliever (1 Timothy 5:8). Paul doesn’t specify what he means by provide, but I know my wife and I provide food, clothing, and shelter for our children. But shelter also needs safety and security, also know as defense. But why? Why do I feel the need to defend my family? Why did Nehemiah want his people to defend themselves? Why did Jesus warn his followers they would need to take their personal safety into their own hands? Love. I love my family and want to be sure their safe – by any means at my disposal. Nehemiah loved his people, and wanted to see them safe. That included seeing them properly armed and a protective wall built. Jesus loved his followers, and he loves us, and wants to see us all safe from evil people. John Lovell of the Warrior Poet Society has some great content about being a lover of people, willing learn how to and to do violence to protect innocent people from the evil people of the world.